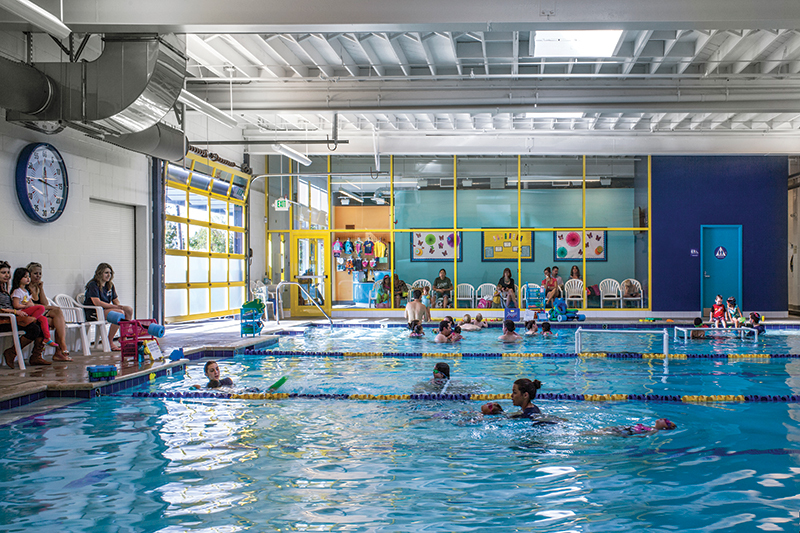 Splash Swim School, adapted from a 1920s-era auto maintenance garage, includes a shallow warm-water swimming pool with welcoming entry lobby and adjacent changing areas. 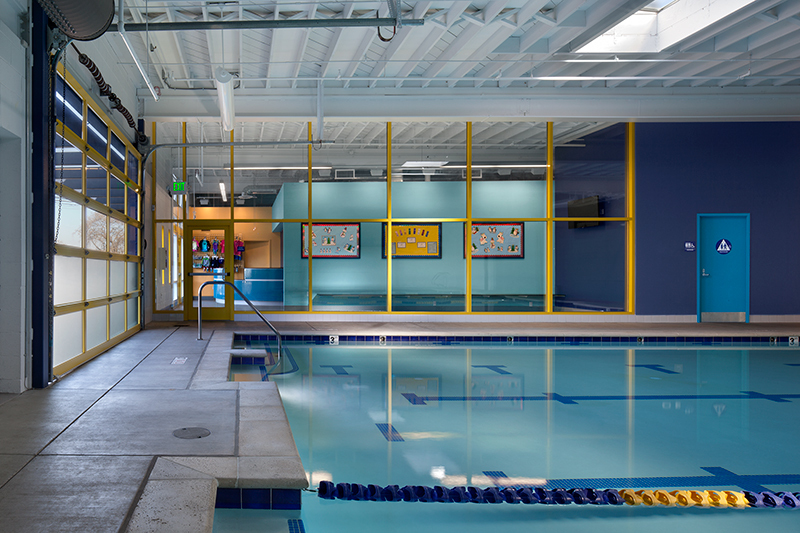 Flooded with natural daylight, the colorful natatorium enhances teacher/student interaction and parent involvement in the swimming programs. 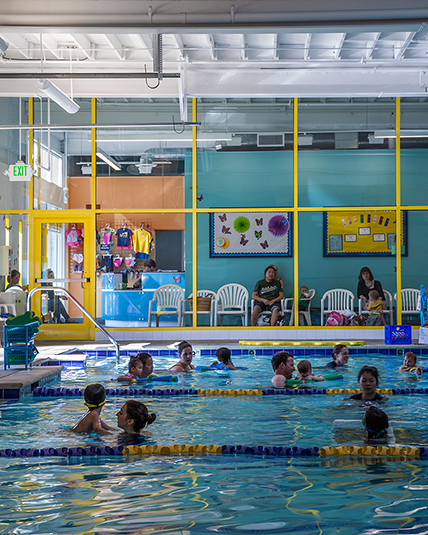 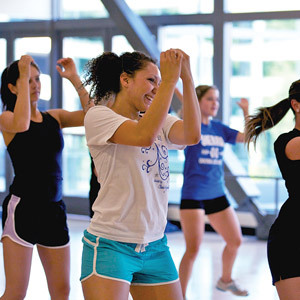 Adjacent to the natatorium is an air-conditioned viewing area with seating and a full-height glazed wall, which allows parents and caretakers to comfortably watch their children during class. 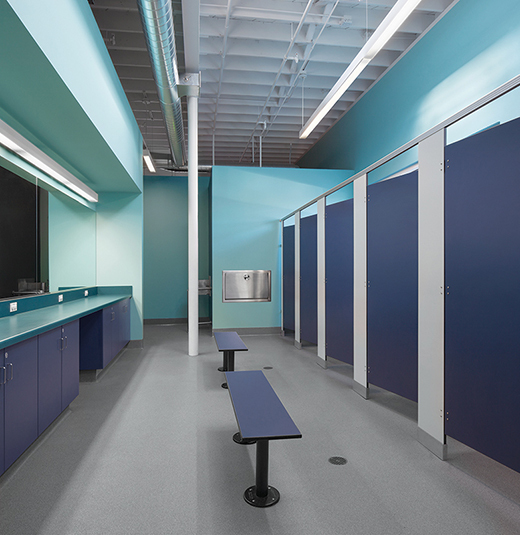 A short corridor leads from the pool deck to the restrooms and a unisex changing area, which allows caretakers or parents of either gender to assist small children in individual stalls. 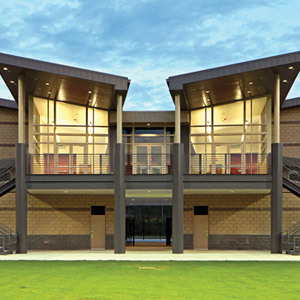 The industrial concrete block walls and wood-framed roof of the auto garage provided a robust and durable backbone for the natatorium. 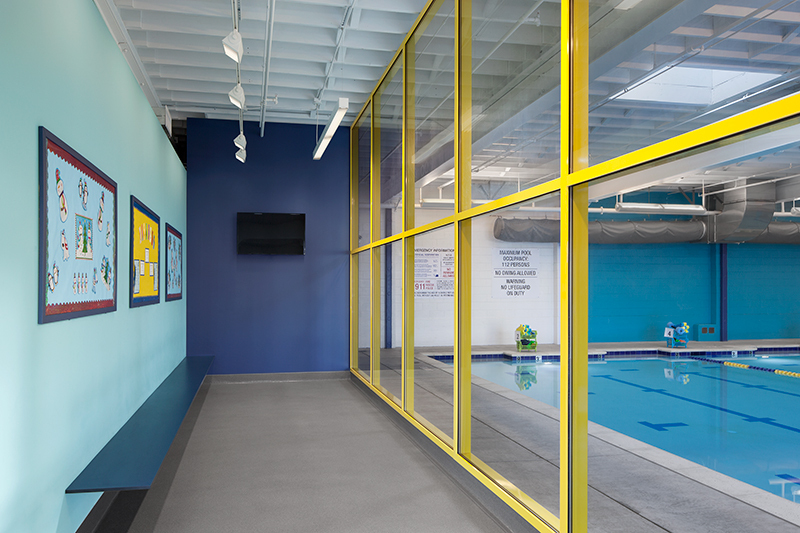 Bold blue and yellow paint finishes accent and protect building elements and create a lively environment for children. 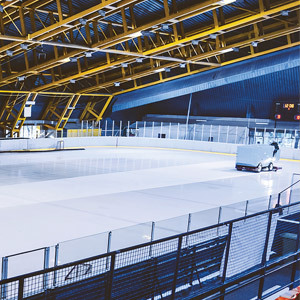 The existing wood-framed ceiling and steel beams were painted in white epoxy paint for durability and reflectivity. 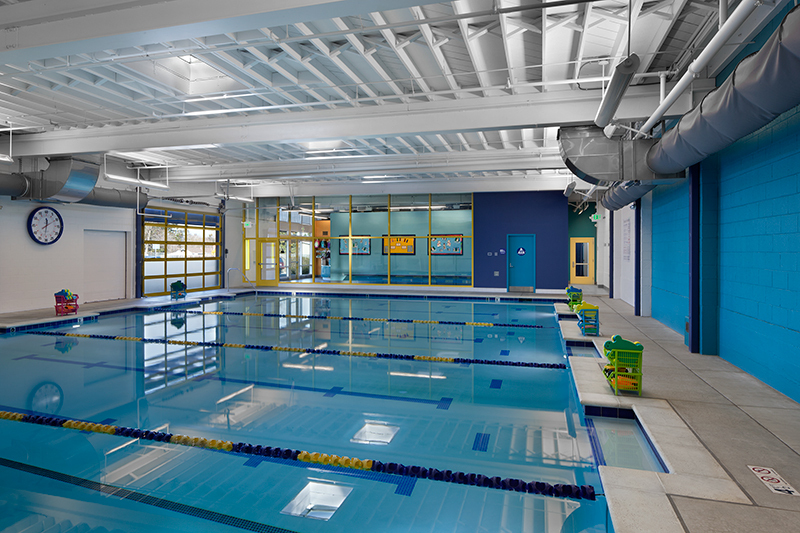 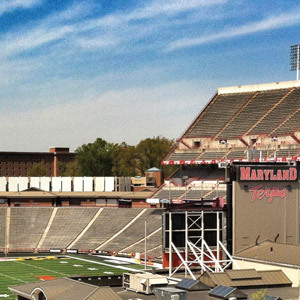 Wall-mounted lighting fixtures uplight the exposed roof structure, increasing the sense of space in the natatorium. 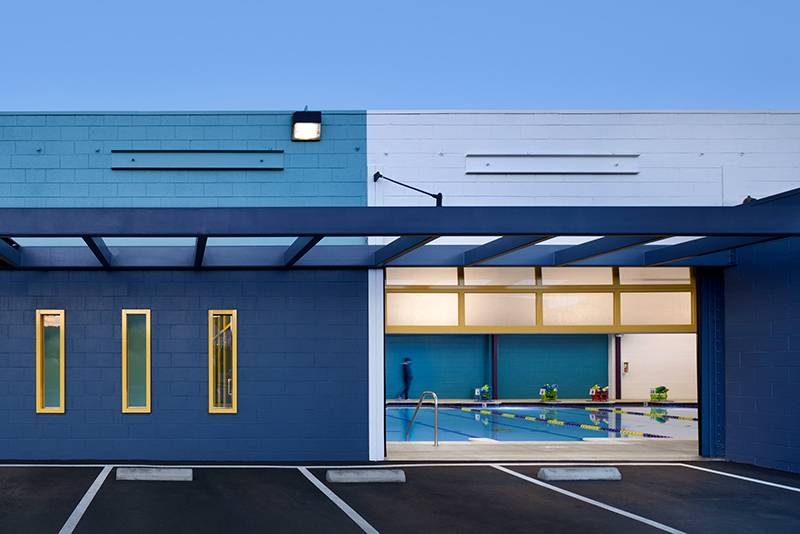 The bold exterior color scheme draws attention to the new swim school, and an entry trellis ushers families into the sunlit reception area. 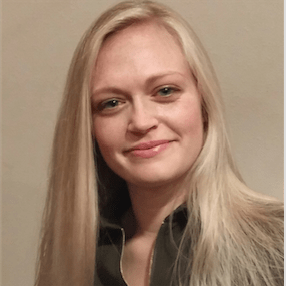 Pools - Heaters: Lochinvar Corp.